What originally led me to The Archived? Well, to be honest, laziness. In my downtime at work, I peruse goodreads for descriptions that strike my fancy enough to make me check our system for the book’s availability. I stumbled across the page for Victoria Schwab’s Vicious. I was intrigued by the description and the high rating, and a quick search of our directory showed me that our library had a copy available… four floors below me. I’m not terribly lazy, but I do admit that I made a mental note to go seek the book out the next time I ventured downstairs, and then returned to my goodreads browsing. The reviewers of Vicious seemed to continuously recommend Schwab’s other books, which just so happened to be…what’s that? Young Adult? Well, well, well… that just so happens to be my home turf. A couple clicks later, and I’m staring at the screen, wide-eyed in awe of the description of The Archived. 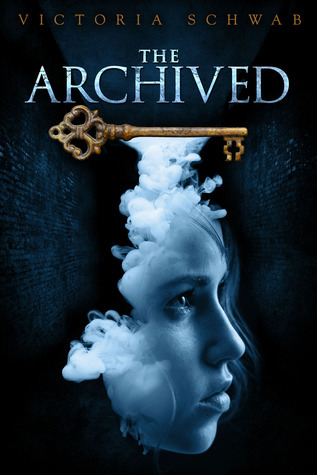 Mackenzie Bishop has been selected to replace her grandfather as a “Keeper”, someone who tracks down the restless dead known as Histories before they can escape the Archive into the Outer (our) world. Not only must Mac cope with the grief of just losing her younger brother, but her responsibilities as Keeper begin to push her to her limit. She must balance her lies, her family life, and still keep her wits about her as she discovers someone has been altering the memories of the Histories. This threat could lead to the downfall of the Archive itself, forever cutting Mac off from her brother and her grandfather, Da. I immediately located The Archived among our YA shelves, and happily carried it home, thinking I’d have a book to last me the weekend. Nope! My first day off, I spent utterly consumed by this book. Could NOT put it down. Maybe it’s just the librarian in me, but the thought of library shelves filled with shell bodies of the dead whose memories can be read like books… well, the premise just automatically appeals to my taste. Factor in mysterious murders and intriguing, secretive characters, and you have me hooked. I was fascinated by the ins and outs of how the Archive worked, especially with how Mackenzie would track down the Histories in the Narrows (the space between the Archive and the Outer). There was a romantic angle (or should I say angles? ), but it didn’t overwhelm the story, for which I was grateful. Heavy topics like death and unhealthy relationships, were touched on gracefully and with language that felt comfortable coming from a sixteen year old. Victoria Schwab hits it out of the park with her creative style, delicate weaving of story lines, and a pacing that builds anticipation in the last half of the book as Mackenzie starts to piece together mysteries from the past and present. Schwab doesn’t reveal absolutely everything about every single character, she reveals only enough to keep you wondering. Who should Mackenzie trust? What motivation does this character have and is it genuine? At first, it wasn’t very clear that Da was Mackenzie’s grandfather. Had I not read it in some of the other goodreads reviews, I probably wouldn’t have caught on so quickly. The semi-romantic interest in Owen felt a little strange and rushed. She may have been curious by him not slipping and felt pity for his story with his sister, but a lot of their romantic scenes where she’d take comfort in him just felt AWKWARD. You’re a Keeper, you know what Histories are and what is supposed to happen with them, and to go beyond overlooking all that, break who knows how many rules, and form some sort of bond with that History…well, it didn’t feel true to character. Her best friend. Heck, I can’t even remember her name now, and that’s why it bothers me. Mackenzie’s best friend from before she moves makes appearances in the book only through phone calls and then an actual visit in the last few pages tying together a happy ending. Does she remind us that Mackenzie is still trying to be an average teenager with average teenage friends? Sure. Does she do anything to further the plot? Nope. This character mostly just feels to me like filler. The sequel to this book, The Unbound, has been waiting anxiously on my Kindle for me to finish this post. I’ve definitely been having trouble resisting the urge to delve into it, but I forced myself to get my predictions in writing before beginning. So…SPOILER ALERT… here are some things I predict for The Unbound. Wesley and his guyliner will definitely be back and making his way out of the friend-zone. Of course, Mackenzie will still be working through her feelings for Owen the Psychotic History. I feel like Da will have a much larger presence in this book. It’s already been stated that the Librarians are the Histories of those who have worked for the Archive, so it just makes sense. What else is he going to do? Stay dead? I don’t think so. I fully expect Da to be a Librarian. We already know that in this one Mackenzie will be starting her new school. Which I guess can only mean high school drama will be finding its way into her already stressful life. This should also give us new characters and new developments, and will somehow work into whether the Archive will remain vigilant or fall. So, there you have it! Pick up The Archived by Victoria Schwab at your local library, bookstore, or online, and let me know if you enjoyed it as much as I did! This entry was posted in Book Review and tagged amreading, archived, book review, books, disney, disney hyperion, fantasy, library, off the shelf, review, schwab, series, victoria schwab, young adult. Bookmark the permalink.